Founded in 1999, Grapesyard Organization celebrates 20 years of rewarding community service. Hundreds of children living in the slums and from economically challenged communities have realized their potential through an array support services such full education sponsorship, school feeding program, primary education, children home for orphans and a drop in child protection services for babies whose mothers work in the garbage dumping sites. At the moment the organization reaches out to over 1500 needy children with education, food, shelter and vocational skills training. By celebrating 20th anniversary the organization is reaffirming its commitment and zeal to care and support orphans and vulnerable children and to lift them out of poverty cycle. Join our child sponsorship program and experience a remarkably rewarding venture. Reach us on email – info@grapesyardkenya.org, face book – news@grapesyardkenya.org or website – www.grapesyardkenya.org for more information. Grapesyard Organization (Grapes) is Kenyan Non-Governmental Organization (NGO) founded in 1999. It started with a school (Grapesyard Education Centre) and has expanded to other community programmes to cater for orphans and vulnerable children (OVC) and the marginalized groups living in informal settlements and economically challenged communities. One such informal settlement is Korogocho slums in Nairobi. The organization is preoccupied with child protection, education, nutrition, personal growth and self-attainment. It is run by board of Directors, one executive Director and three full time Managers. • Grapesyard Education Centre: School is located in Nairobi´s Korogocho slums and it reaches out to over 1,200 children daily with quality subsidized primary education. It has consistently posted good national examination results since 1999. Many children have come through the school to join Kenya’s National schools and top public universities in the country. • School feeding program: Hot lunch is offered to children during school days because majority of households in the informal settlements survive on one meal a day or none at all. Thus many children come to school in the morning having slept on empty stomach and missed breakfast. Because of this children hardly concentrate in class due to hunger and malnutrition, class attendance is not consistent as they opt for street and dumpsite to fend for themselves. On weekends, children from the poorest of the poor families are given food rations. Overall the program reaches out to more than 1,200 children. • Child Sponsorship program: The program supports children to meet food, clothing, healthcare and school fees costs for children in primary, secondary, middle level colleges and entry fees for University education. There are over 600 past beneficiaries of this program. The beneficiaries also play the role of mentors and role models for younger children and thus become agents of change in their communities. This work is changing community one person at a time. • Grapesyard Children´s Centre (Alice Village): Opened in 2008, Alice Village is a children home with a capacity to accommodate 100 orphans and vulnerable children. The home has successfully helped over 200 children reclaim their future. The home is located in Nairobi County, Njiru Sub-County, in Utawala area. Key activities at the home include child re-intergradation program, Mentorship and child care and protection in provision of balanced diet, clothing, shelter and education. Some of the children who were accommodated in the home are now in employment, three are going through graduate courses in Kenyan public universities, while others are pursuing Trade Test and Artisan training in various technical fields. • Early Child Development Education Centre (ECDE): It is located in Grapesyard Education Centre. The centre serves children under the categories of baby class (three year olds), nursery (4 year olds and pre-school (6 year olds) and their parents. Besides early child education for the children, the centre also equips parents and mothers in the community with skills for better child care and protection through scheduled workshops. • The Digital Literacy Program (DLP): Grapesyard School offers computer literacy lessons for its children in line with the Government’s requirement that all schools in Kenya should embrace and offer the program for the children in their centres. The school currently has a small computer room with 15 fully working laptop and two Desktop computers. • Community Economic Empowerment: Grapesyard Self Help Group an arm of Grapesyard Organization is a willing membership grouping for Korogocho slums inhabitants. The Organization uses it to economically empower group members through table banking financing. Members of the group obtain start up loans to open and operate income generating activities within the slums. • Day care Centre: The centre is a drop in child protection centre for babies whose mothers work in Dandora dumpsite. To protect the children from hazardous substances in the dumpsite, mothers drop in their babies at the centre in the morning for babysitting, provision of balanced diet, bathing and healthcare during the day while the mothers proceed to work. This ensures that the family income and child’s wellbeing are both protected and safe guarded. The centre is located on the eastern edge of dumpsite for ease of reach by the mothers. • Sickle Cell Anemia (sickle cell warriors) support group: The Organization runs a support group at its Korogocho project sites to help the warriors and their families cope with the decease. Besides equipping the families with basic knowledge and care skills, children are also referred and linked up with hospitals and organizations that offer free services for sickle cell warriors. The support group has 10 members. • Youth Mentorship: The organization runs a youth mentoring program for youth both in and out of school. By being linked up with a mentor, mentees gain knowledge and skills from mentors, and also mentoring provides professional socialization and personal support to facilitate success in school and in life. • HIV/AIDS Concern: Grapesyard works with children, youth and the general community to increase HIV/AIDS knowledge in the informal settlements. The organization also collaborates with HIV/AIDS mainstream organizations and Companies to organize community medical camps where HIV/IADS testing can be done and infected persons are referred for care and treatment. • "I keep A child a live project" is an initiative in partnership with Supermarkets. The organization uses this project to enlist community support and participation in child care. The project runs donation tins in supermarkets outlets to raise funds for children feeding, education, clothing and healthcare and other forms support. • Mzabibu Newsletter is an annual publication of Grapesyard organization by the Director´s office. It aims at increasing the organization´s visibility; document success stories and lay down future plans. 2. Implement strategies to grow target groups and programs diversification. 3. Re-engineer our internal processes to enhance efficiency. 4. Continuously build our organizational capacity for growth and development. Edmond Opondo Oloo is the Executive Director of the Grapesyard Organization. 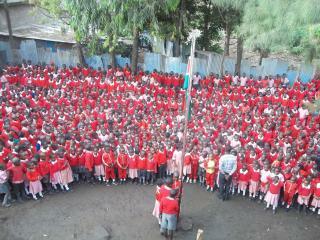 Grapesyard school children hoist national flag during school assembly. Examination time for children in Grapesyard school. Nursery school children graduate and transit to primary education at Grapesyard. The incomplete classrooms. It promises to boost learning experience and outcomes by slum children.